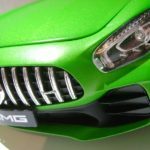 The Mercedes CLS AMG trim package was not to your liking? Too tame, its 6-cylinder too purry, its design too fashion-accessory domestic-cat-walk? Do you want to ride the untamed tiger, hear its raw V8-biturbo-roar, feel its brute force of 585 horses? 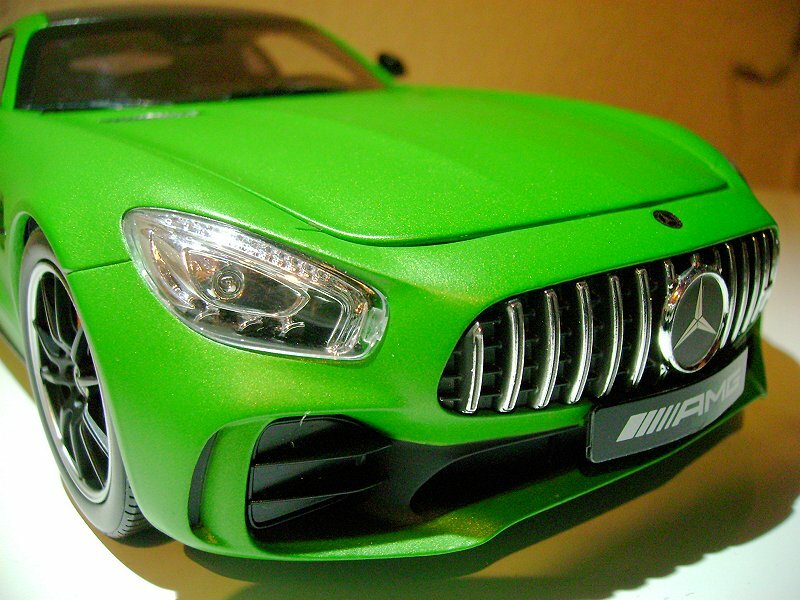 Then here it is: The Beast of the Green Hell, Norev’s dealership edition of the AMG GT-R in AMG Green Hell Magno. 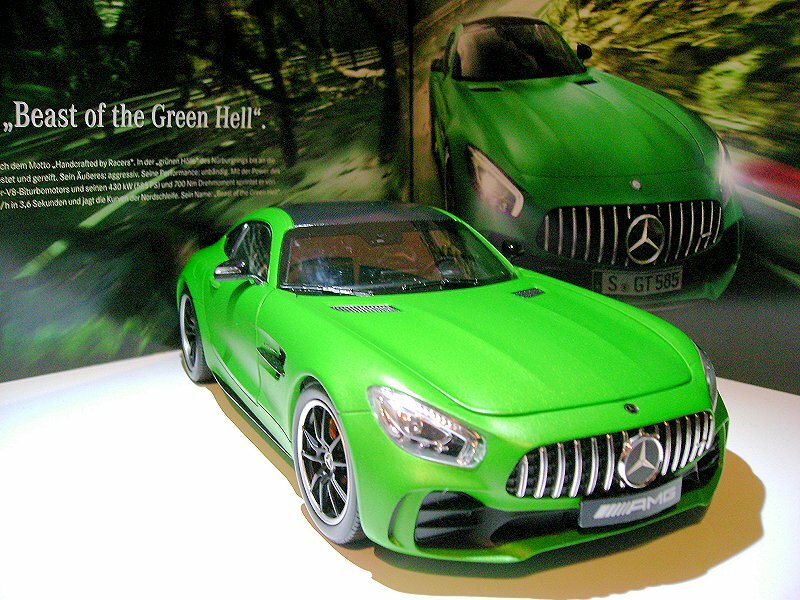 The Green Hell that this car pays tribute to is the Nurburgring race track near the western border of Germany. 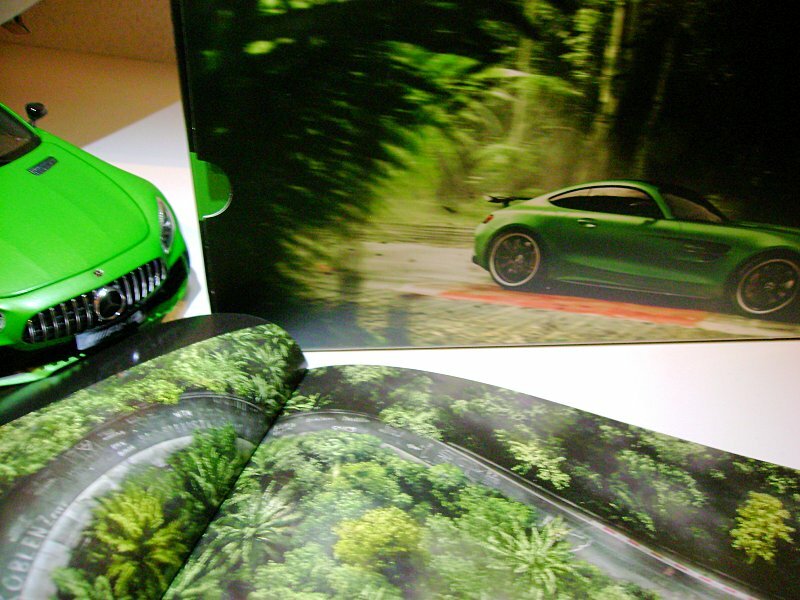 The model’s box and the brochure depict the green Beast rushing through a jungle race track. I live 200 km away from the track on the same parallel and didn’t know that global warming has prompted palm trees to grow there. But perhaps the Beast’s Tyrannosaur carbon footprint changes more quickly the vegetation near its natural habitat that it only leaves to leap at an unsuspecting Toyota Prius from the slip road from 0-100kph in 3.6 secs and rip the sheep’s clothing off a clean-diesel-Volkswagen en passant along the fast lane of the speed limitless Autobahn at up to 318 kph. Very dramatic introduction? Well, that is how Mercedes and Norev present it to us. 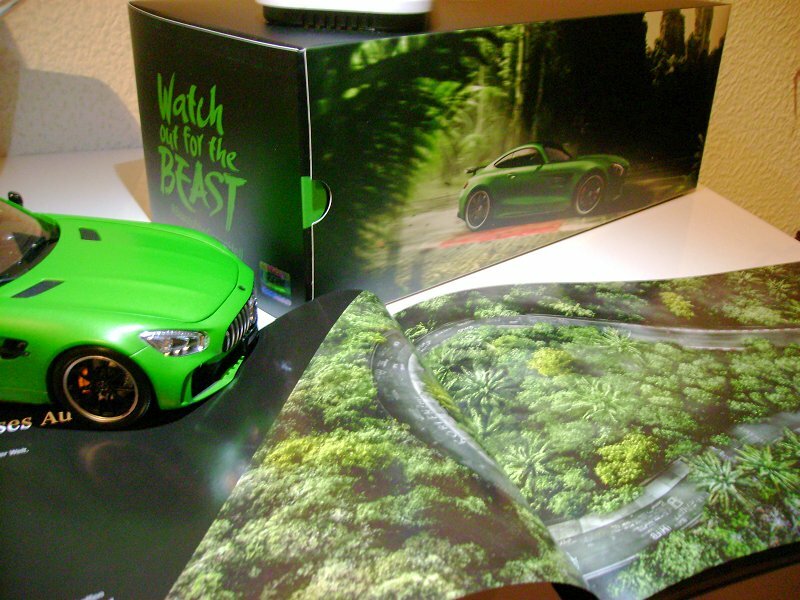 The brochure teems with wild animal allusions, Norev’s box does the same and look at the thing’s colour: AMG Green Hell Magno, despite being a matte colour, visually roars at you. Norev has made a good effort with the paint job, but it has flaws with dust enclosures in some places. 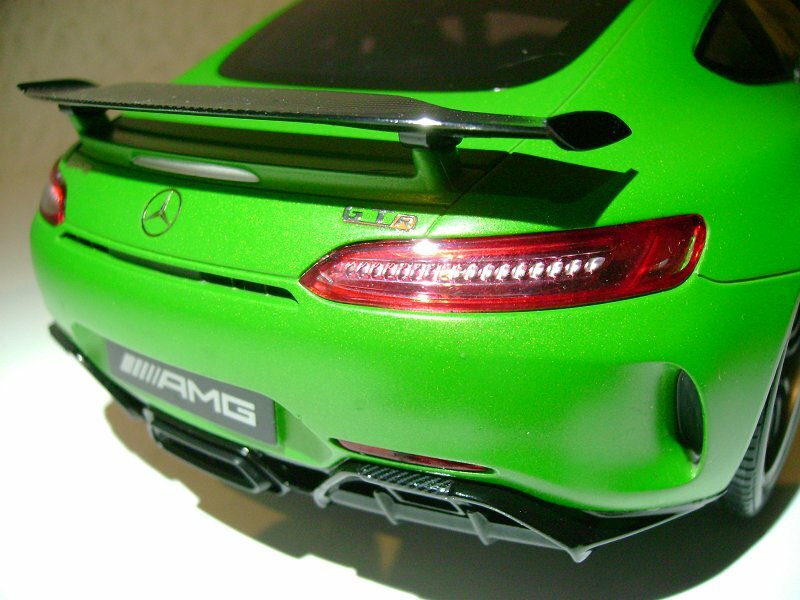 Panel gaps are okay but not as tight as on the CLS. The real roar would usually be emitted from the titanium exhausts all of which have the unfathomable depth of real openings. 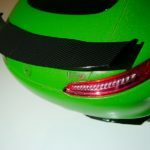 The carbon imitation details over the left and right exhausts are really good, just like on the rear wing and the roof. 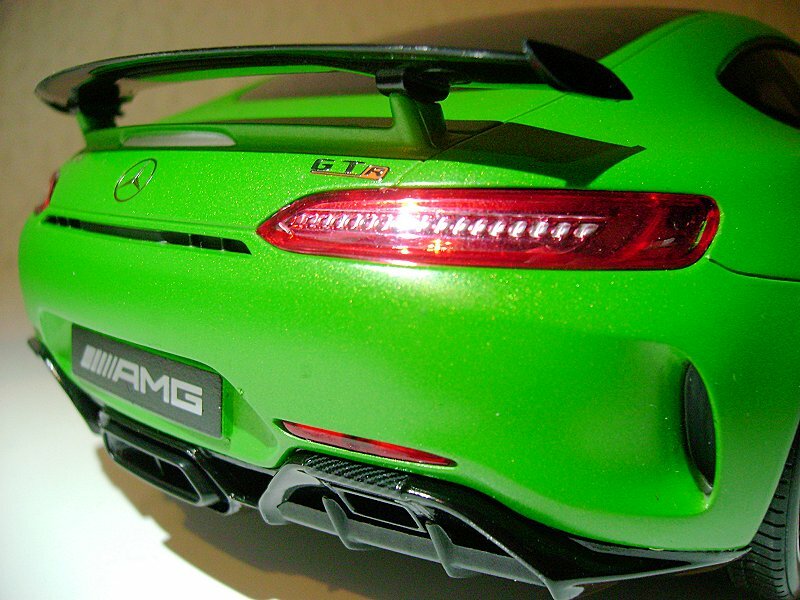 All the badges on the rear end are photo-etched convincingly and the rear lights show good LED detailing. 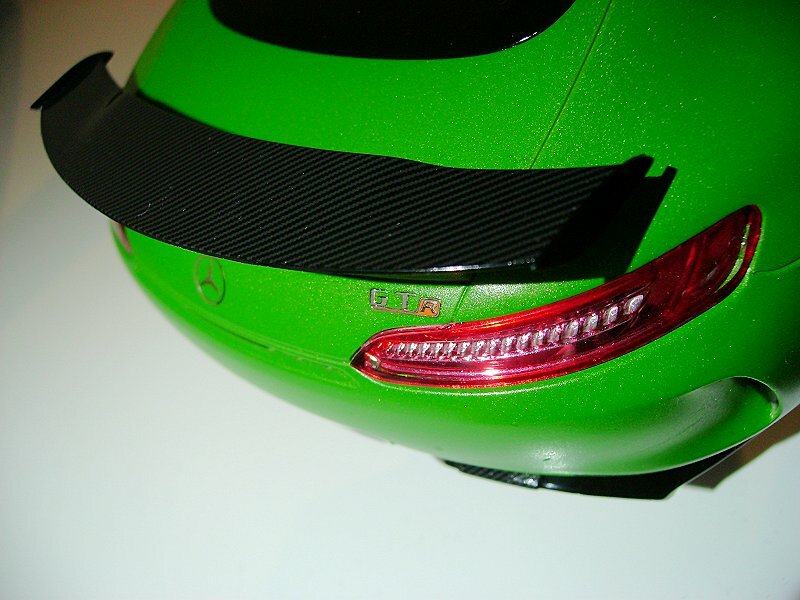 The additional rear reflectors above the exhausts again show their moulded mounting pin as a darker spot. 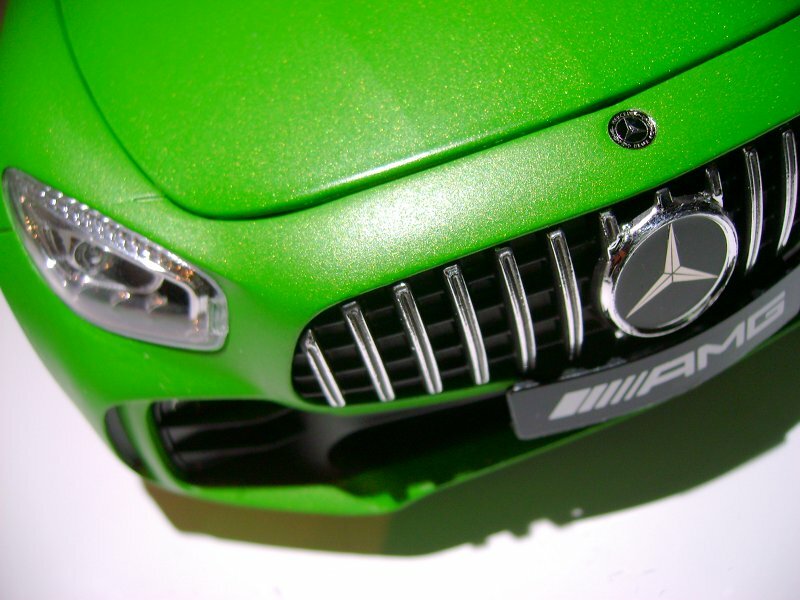 The air vents in the rear wheel arches have black plastic inlays to feign an opening. The rear hatch does not open on the model. Norev has become quite good at making rims. The Beast’s black and silver paws are no exception with the AMG script and a photo-etched centre star. 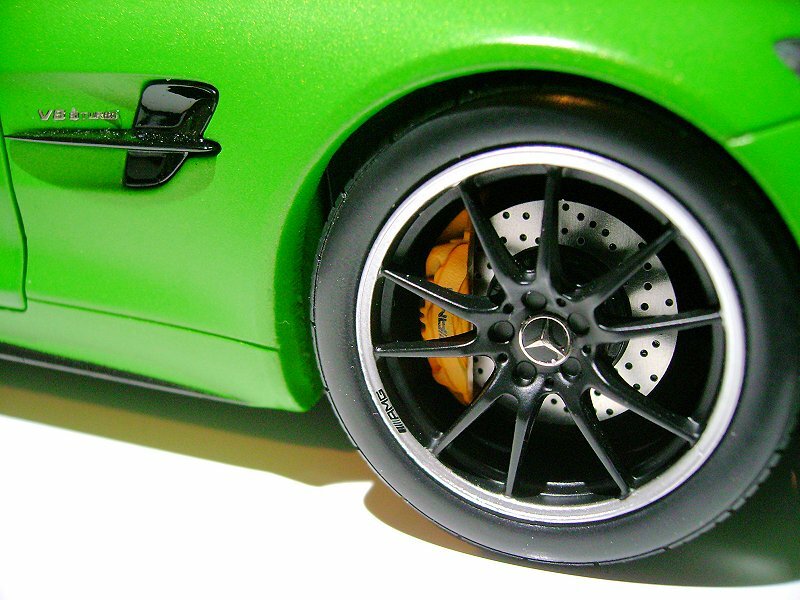 The brake disc and caliper are better than on the CLS, really good. Come round the front, look the Beast in the eye … and feel your confidence wane. No, not from being impressed, but with a bit of disappointment: The one-moulded-piece chrome reflectors are a bit crude, and the clear lenses mounting-clip again shows next to the chromed Americana grille-bars that are a bit too thick IMO. 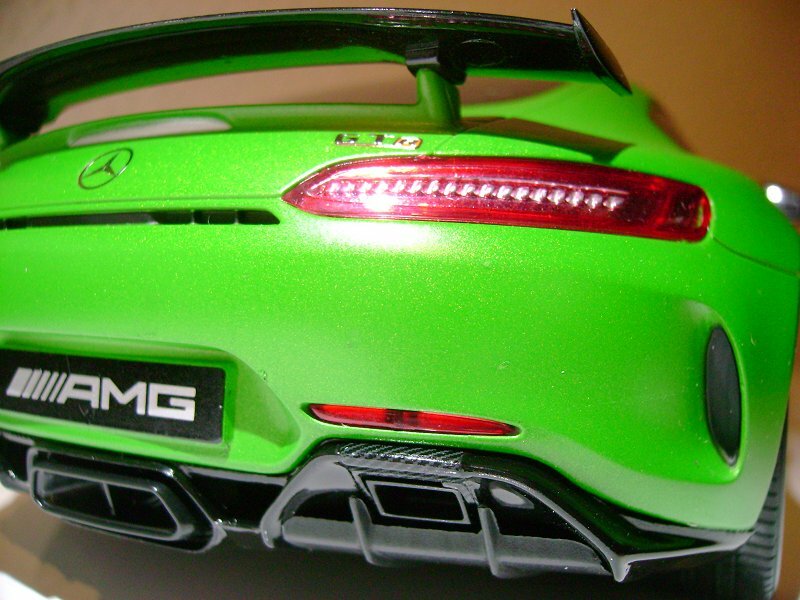 The AMG script linking two of the bars is a nice touch, though. 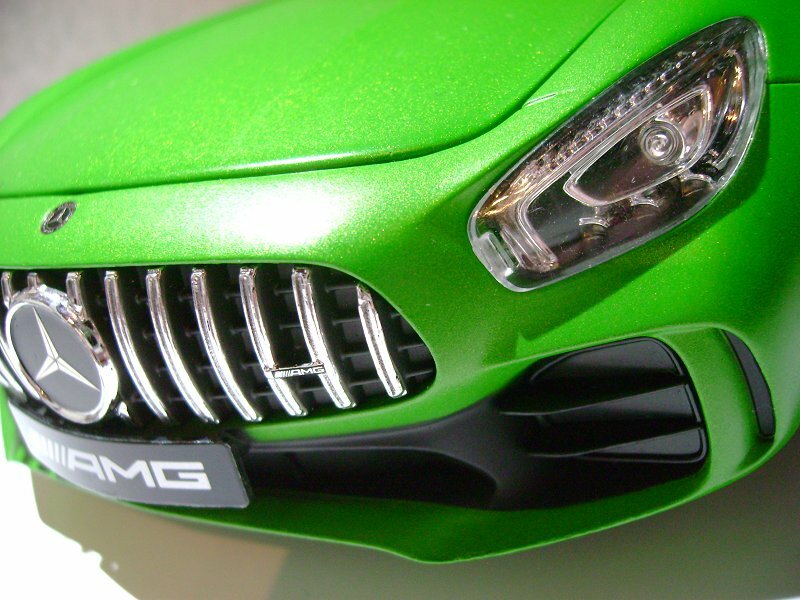 The air inlets beneath the headlights are closed in flat plastic miss the chance to have the Beast breathe down your neck. 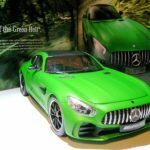 Experience does not raise your expectations when popping the doglegged hood to glance at the AMG´s beastly 4-litre V8-heart. 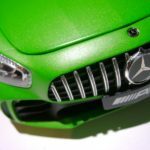 Surprisingly, it is covered in carbon again including the sticker of who has built the engine, but in all other respects, it is the expected disappointment of moulded plastic. 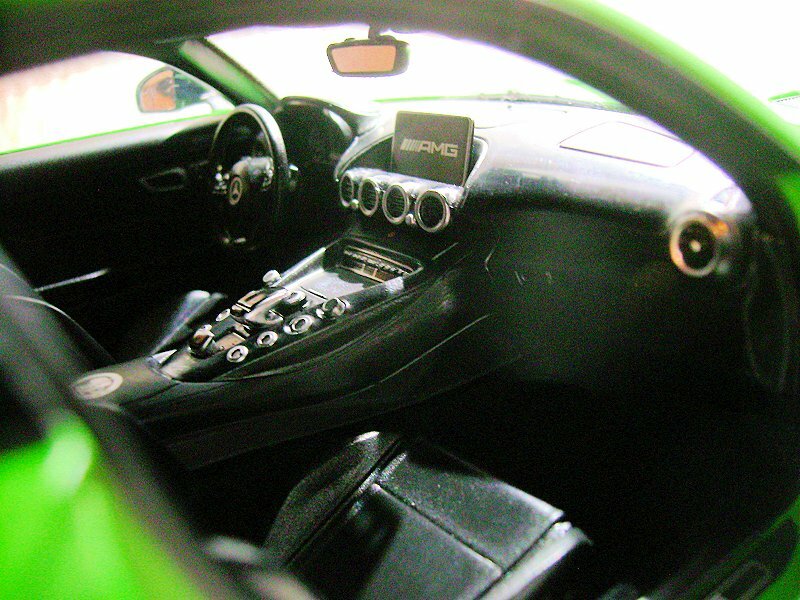 The real disappointment, however, is the model’s interior. Sorry, but that’s more Welly than anything else. 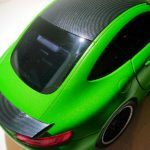 With all the carbon options ticked on the rest of the car, the interior is flat black plastic and does not show the optional carbon package. 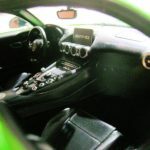 The outstanding feature of the GT-R famously is the yellow traction control knob underneath the central air-vents, but here you merely get a yellow dot on a panel that is not upright enough. 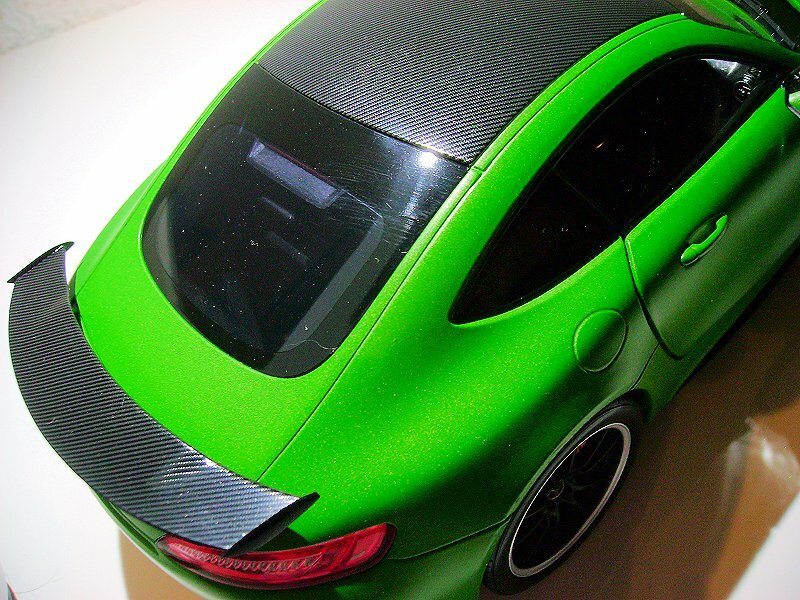 Yellow contrast stitching and yellow seat belts are only an option on the real vehicle but come on, Norev, with a screamingly green exterior colour you would really want the yellow and carbon accents inside. 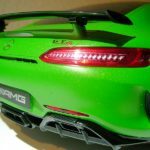 Do I recommend Norev’s AMG GT-R? 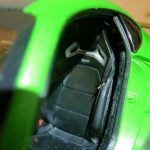 Well, the GT Spirit resin version will be better on the exterior and have the yellow seat-belts, a proper traction control, knob and carbon interior applications, even if its centre console buttons will only be painted on – at a lower price. 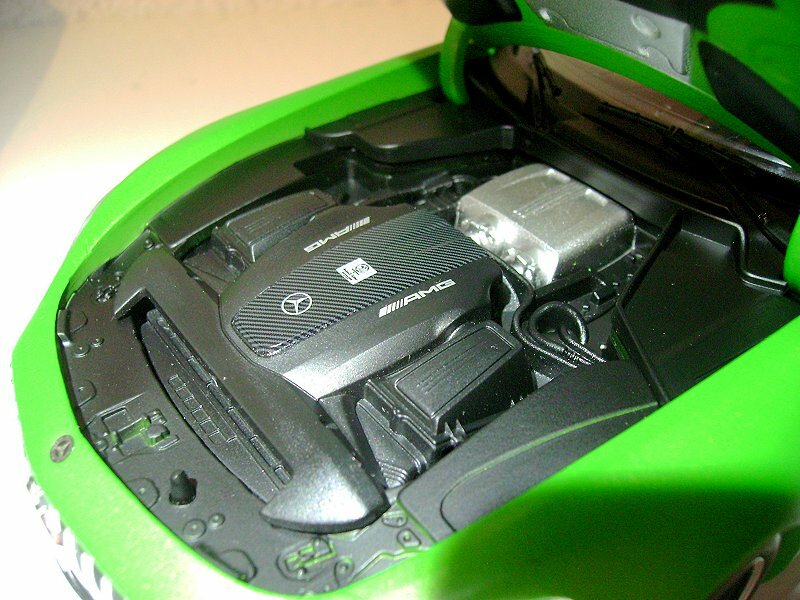 What’s the point of a fully opening model, if you don´t make the effort on the interior. 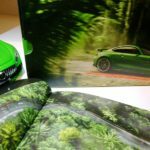 AUTOart will give us their version of the Green Beast and based on their other AMG GT versions, it´s clear that it will beat the Norev hands down, not to mention that Almost Real has announced the Green Beast… So it won´t be Norev’s dealer edition if you follow Mercedes’ own slogan: “The Best or Nothing”. 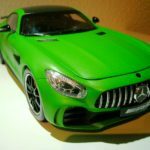 16 Responses to "REVIEW: Norev Mercedes AMG GT-R Dealer Edition"
Great review, thanks for sharing. We would agree on all our touch points. 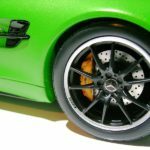 Absolutely agree here too “imitation details over the left and right exhausts are really good”. Well done. 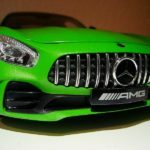 As you mentioned, our team will wait for the results of the AUTOart or the Almost Real piece before be make our buying decision. This hobby calls for patience, some have the ability and other don’t! 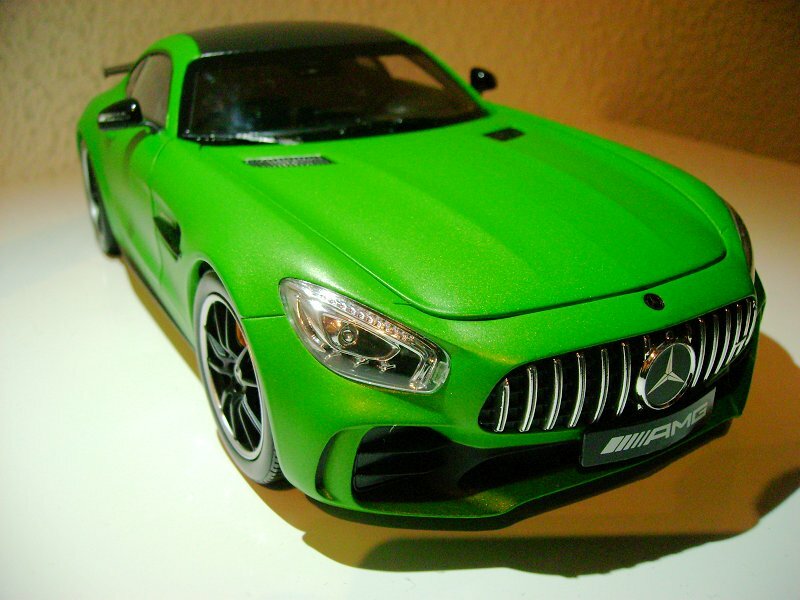 I didn´t check enough that AUTOart and Almost Real had announced the very same car, BEFORE I spontanously bought this model. Big mistake, I usually do nothing spontanously, but tend to triple-check. So you can imagine, that I suffer from buyer´s remorse. 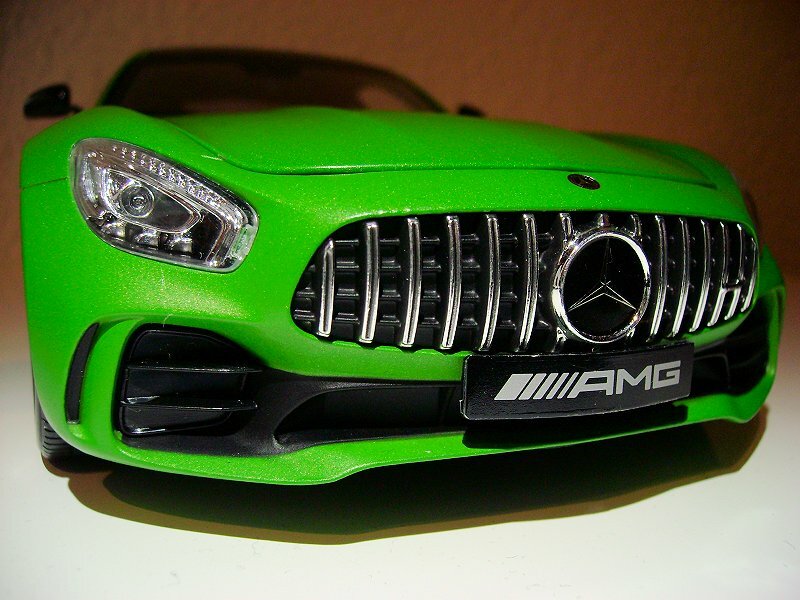 Not saying your purchase was wrong… The AUTOart and Almost Real version will cost considerably more. This is a case of priorities, how good do you require your GTR? Well, look at my collection. You´ll see that I tend to go with the Mercedes slogan, so I really should have waited (if only I had known the Almost Real is coming). 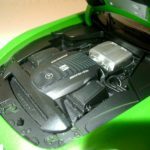 As a seasoned collector I should have known that unlike the CSL that is unlikely to be made in any decent opening quality by anyone else, the Green Beast is one of the supercars surely to be made by many, including the benchmark manufacturers. Hence the buyer´s remorse. Err, just noticed that you (or the spell check) changed “purry” into “pretty”, but I did mean “purry” 6-cyilnder, like “purr” … tame cat-sound, you know? When did this come Out? Was it only released in Europe right now? A few weeks now. European Dealer Edition. Thanks for the review. I just bought this one and maybe i should have waited. I also pre-ordered the GTR from GT-Spirit. Do you think that one is better after looking at the pictures of the GT Spirit one? Or should i cancel and wait for the Almost Real GTR? In our opinion, open vs. sealed any day! Cancel the resin/sealed! Completely agree with your rating list. The Norev based on your review/pictures and other picture from collectors I have seen (huge panel gaps) is clearly the worst option – opening or not. 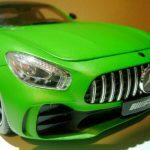 I base my opinion on the reviwe on the GTS from AutoArt .I just fear the GTR will be the same kind as the GTS based on the reviwe i was reading here. 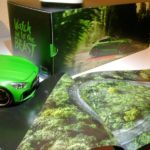 Thats why i would wait for the Almost Real GTR. But i will probebly customize the one from Norev. The rotors are too small compare to 1:1, so Norev also suffers from the Mattel/PMA symptoms. I will wait for the Almost Real version personally. And I have to say it’s better than I thought. My biggest fear was the color, but it was just an excess of light in the photos I had seen. 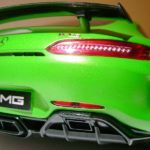 The “green hell magno” is correct. That if, being mate is much more delicate than a metallic paint. For the rest, I totally agree with everything said in this article. 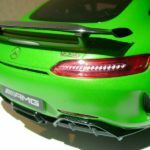 I do not understand how Norev having already done the AMG GT-S and leaves the trunk without opening.The blind air intakes is already a useless war. 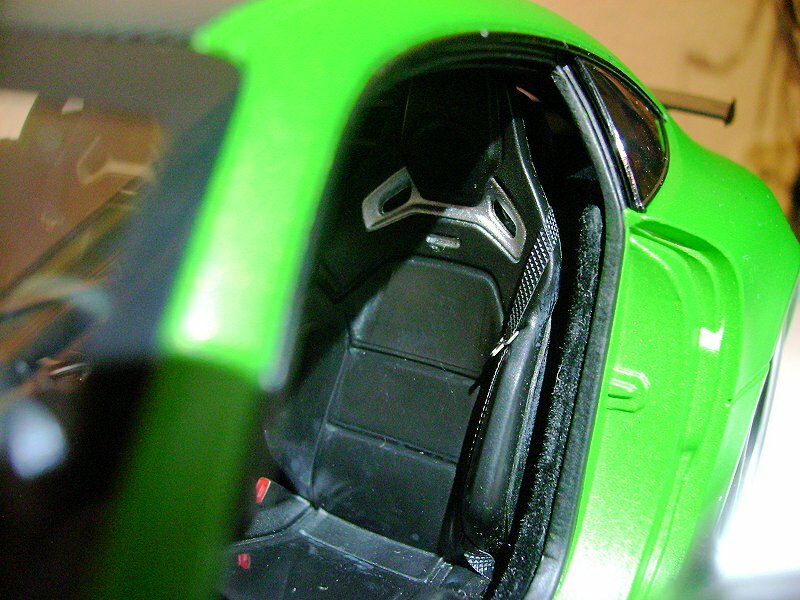 And the interior, and the belts are not yellow, is a scandal. They are incomprehensible details after having paid €150.